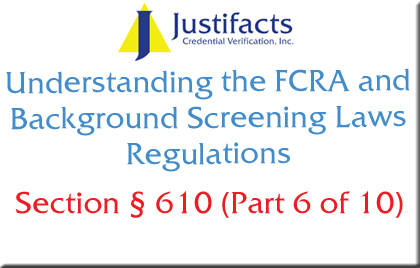 Section § 610 of the FCRA deals with the approved methods used to provide disclosure to applicants (consumers). Typically, a consumer report is provided in writing; however, there are permissible alternatives if authorized by the applicant. Proper Identification – A Consumer Reporting Agency (such as Justifacts) shall require, as a condition of making the disclosures required under section 609, that the consumer furnish proper identification. 4. By any other reasonable means that is available from the agency. Trained Personnel – Any consumer reporting agency will provide trained personnel to explain to the consumer any information furnished to him/her pursuant to section 609. Person Accompanying Consumer – The consumer is permitted to be accompanied by one other person of his/her choosing, who shall furnish reasonable identification. A consumer reporting agency may require the consumer to furnish a written statement granting permission to the consumer reporting agency to discuss the consumer’s file in this person’s presence. Justifacts provides all applicants with a copy of their report upon request – this can be done online from our website or by contacting the Justifacts Compliance Department. Although most consumer reports are provided in writing, the FCRA does allow some flexibility in regards to the delivery of consumer reports. Please feel free to contact Justifacts to determine which delivery method works best for your situation.